The situation of the wild horses in the southern Namib desert near Aus is becoming increasingly critical. As the Namibia Wild Horses Foundation announced in mid-November, the urgently needed winter rains in the area did not materialise. Man helps in a threefold way – but is that enough to save the horses? In the vicinity of the water trough at Garub there is hardly any pasture left, because no more than 5 mm of rain have fallen since 2014. The horses therefore depend heavily on supplementary feeding – at least until the next summer rains, which can be expected in that area as from the end of January. For this reason, donations are needed further on. In addition the horse population suffered from severe losses due to spotted hyenas. Gemsbok and springbok herds moved north in the first half of the year, where more grass was found after rainfall. The hyenas then focused more and more on the horses, which depend on surface water and thus do not leave the area near the water trough. The population has now dropped to 70 stallions and 40 mares. Just over a quarter of them are in good shape, half in mediocre condition and almost a quarter in poor to very bad shape. Many of the weakened horses will not survive. As an emergency measure, with the approval of the Ministry of Environment and Tourism (MET) animal carcasses are laid out as food for the hyenas. Since the beginning of the campaign, the number of attacks on horses per month has fallen significantly. Nevertheless, it can at best help the weakened horses to overcome the worst of the drought. As a long-term solution, the relocation of the horses to a more suitable nearby area is under discussion, where the animals could be protected from hyenas. However, the cost of of 35 million Namibia Dollar (nearly 2.1 million Euro) for the only available piece of land is unattainable. The “Aus-Lüderitz Tourism & Business Action Group”, a recently founded initiative, appeals to MET to retain the population at Garub, also on the grounds that the Wild Horses are one of Namibia’s top 10 attractions, attracting tourists and therefore providing income and jobs in the structurally weak southwestern region of Namibia. 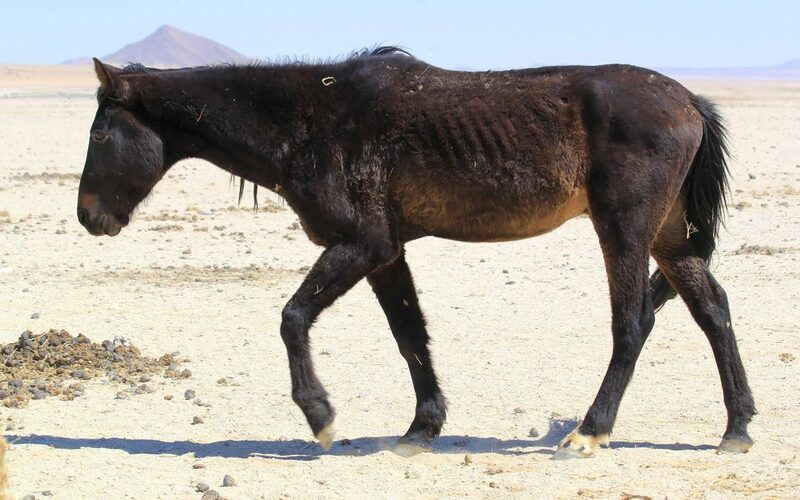 More details and account for donations on www.wild-horses-namibia.com.